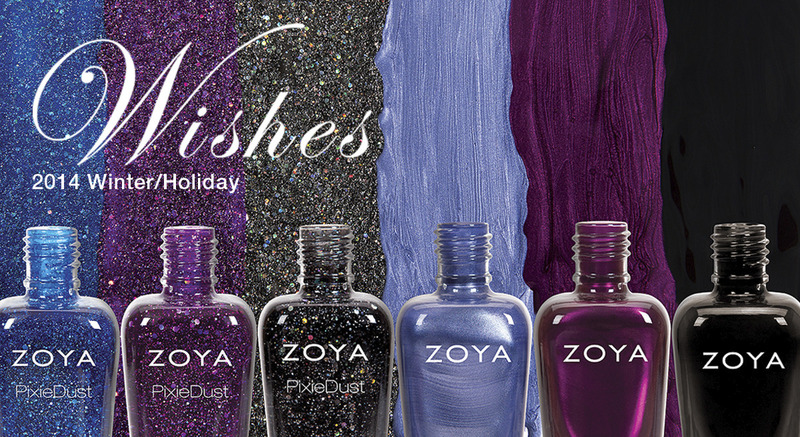 Zoya Holiday Collection - Wishes! Sapphire blue Magical PixieDust with holographic hex glitter From me: There's a character on Stephen King's Under the Dome named Nori. She was kind of a self-serving little twit when we watched. We finally stopped because the storylines got boring and implausible. Not even my husband and I could stretch it that far. I didn't read the book, but my husband did. Deep amethyst Magical PixieDust with an orchid flash, packed full of holographic hex glitter. From me: Thea is Oliver Queen's little sister on Arrow. She started out prissy and annoying, but has turned into a pretty kickass chick. I really do like this show - but we're kind of all about superheroes in our family, so it was kinda a given. Black crystal Magical PixieDust with holographic hex glitter. From me: Imogen is Julia Stiles' character in the rarely seen movie from 2000, Down To You. It's not the best movie... but it's not the worst, either! I rather enjoyed it, and I own it on DVD. Actually, I think I'll go watch it now... At any rate, Imogen was a free spirit in the movie, so this polish to me is gonna be whimsical now. Have any of you watched this movie? From me: Of course those who've read the Hunger Games know who Prim is! She's Katniss' sister and the reason Katniss is in the Hunger Games to begin with. From me: Haven, on SyFy, is one of the best shows on TV. It doesn't get much press, but it's truly a great show. Well acted and written, and it's so twisty! You never know what they are going to do. I have a really bad feeling they are trying to kill it - they've moved it to Friday nights at 7. Regardless of where it is in the schedule, I'll watch it! Do any of you watch it? If you like Sci-Fi shows, or shows based loosely on Stephen King novels, check it out! From me: Now Willa is the name of the actress who PLAYS Thea Queen (see above for Arrow reference). She was also on The OC and a few other things. But you can bet that my first manicure with these polishes WILL be Thea and Willa together. Count on it. Preorders start today and the estimated ship date is November 1! Will you be ordering?